The Brazil currency is called the real and its sign is "R$." If you are planning a trip to Brazil, you should know what their currency is. Its ISO code is BRL, and the real is subdivided into 100 centavos or hundredths. Opposite of American Money – Instead of using a decimal point for the decimal separator, the Brazilian reals have a comma. The thousands separator for Brazilian money is the period. For example, one thousand dollars and twenty cents in the U.S. is written as "$1,000.20." In Brazil, one thousand reals is "R$ 1.000,20." Essentially, periods and commas are opposite in Brazilian money compared to American money. Real means "Real" and "Royal" – In Portuguese, the real translates as both real and royal. The Currency of Brazil went through Many Changes – It took eight changes in Brazil currency, for the country to finally settle on the real. During the 17th century, while the Dutch tried and failed to occupy Brazil, the Portuguese ruled throughout Brazil, and the beginning of Brazilian independence, the currency used was the original real. By 1942, as a result of gross inflation, Brazil decided to change its currency to the cruzeiro. In 1967, the cruzeiro was changed slightly to the cruzeiro novo.The cruzeiro novo was short lived, as only 3 years later Brazil changed its currency back to the old cruzeiro. Once again Brazil suffered inflation throughout the 1980's. In turn, the Brazilian government eliminated 3 zeros off of the end of the cruzeiro and yet again created a new currency. 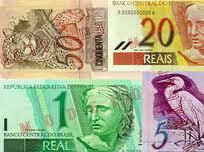 In 1986, Brazil began using a currency called the cruzado. Even with all of the changes in currency, inflation remained a problem, so Brazil chopped 3 zeros off the end of the cruzado. This currency was then labeled the cruzado novo. However, the cruzado novo was even more short lived than the cruzeiro novo. It barely lasted for a full year! In 1990, the Brazilian government reverted back to the original cruzeiro. Inflation continued and by 1993, a transitional currency called the cruzeiro real or plural cruzeiro real was implemented. Finally, in 1994, the current Brazilian reals was established and has remained a relatively stable currency to this day. Each Bill Is a Unique Work of Art – Brazilian bills are made in (1), 2, 5, 10, 20, 50, and 100 real notes. The production of the 1 note has been discontinued, but is still used as it is legal tender. Each note comes in a unique main color in a variety of shades. The 1 is green; 2 is blue; 5 is purple; 10 is pink/red; 20 is yellow; 50 is orange; and the 100 is light blue. In addition, each Brazilian bill has a different animal on the back. For example, the 20 has a golden lion tamarin and the 100 has a dusky grouper (type of fish). Brazilian money is as unique as the culture. A Constellation is Printed on Each Brazilian Coin – Now, in the Brazil currency, the coins are available in 5, 10, 25, and 50 centavos (percents of one real) and 1 real coin. Each coin has the constellation Crux, also known as the Southern Cross, printed on it. The Brazilian word for the Cruz is cruzeiro. I hope you have enjoyed these Brazil facts about the Brazilian money used in this amazing country. Ate logo!